Who said crocheted goods are not suitable for summer? Just find the right model and use a light, cotton yarn and you are good to go. 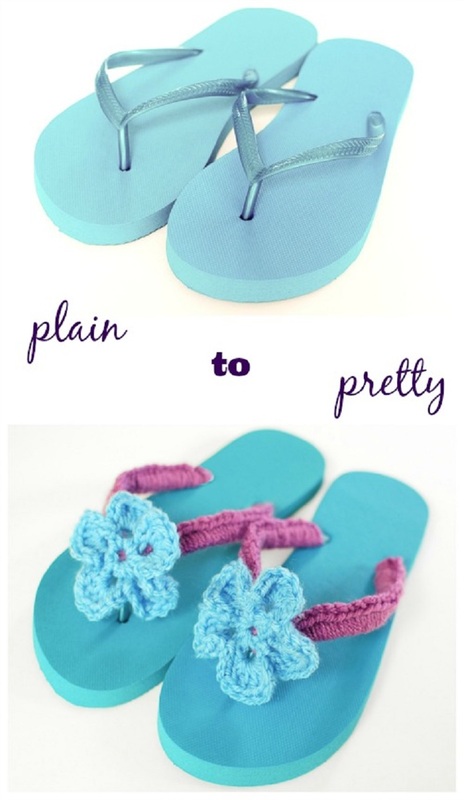 Take flip flops for example – there are so many patterns for crocheting pretty flip flops that will definitely get you ready for the summer. 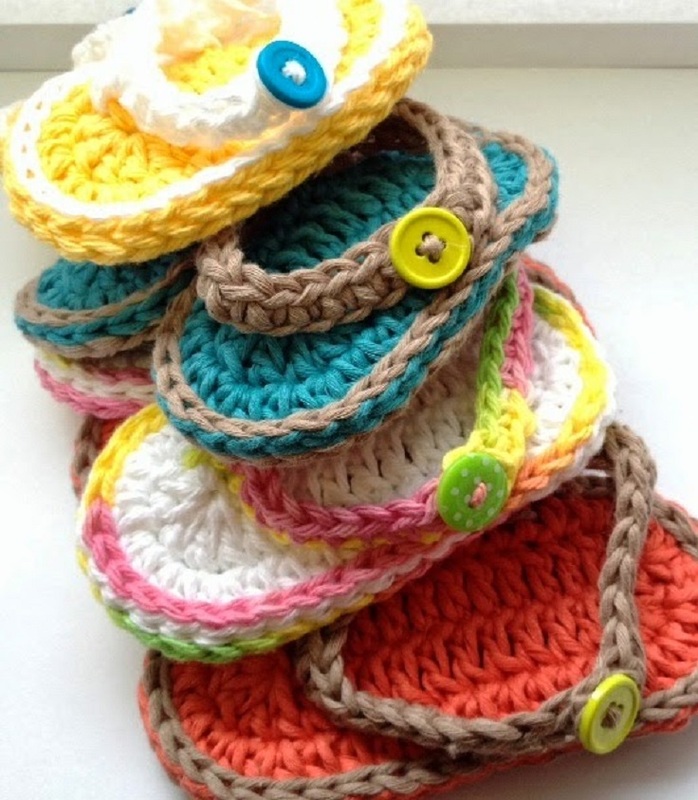 Whether it is barefoot flip flops, baby sandals or simply turning plain flip flops into crocheted goodness, these projects we are sharing will definitely leave you stunned. But they are not only adorable, they are also easy to be made and budget friendly which makes them an excellent gift. Even beginners can make them! 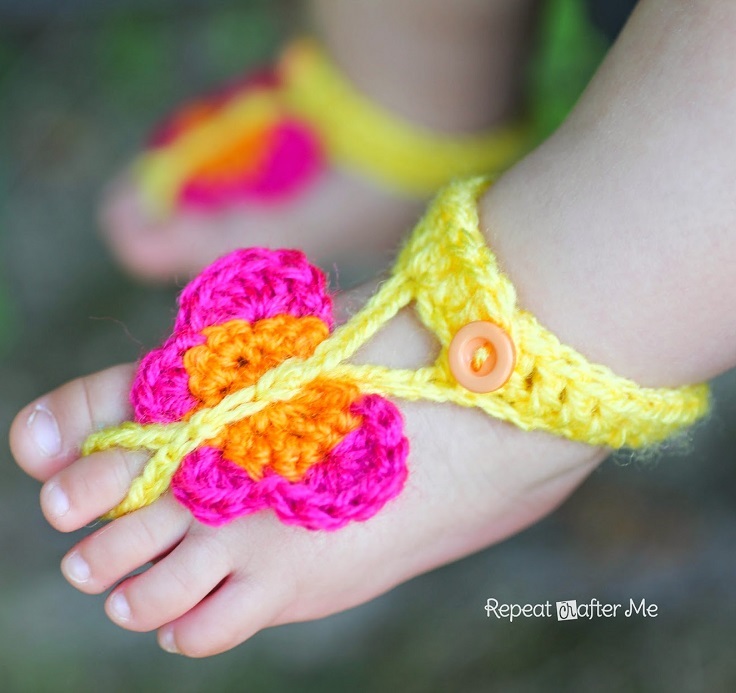 Download this free crochet pattern for beautiful barefoot sandals which are perfect for the beach, chilling by the pool or simply relaxing in your garden on a hot summer day. And they are not just chic, they are also easy to make by using just chains, trebles and double crochet stitches. 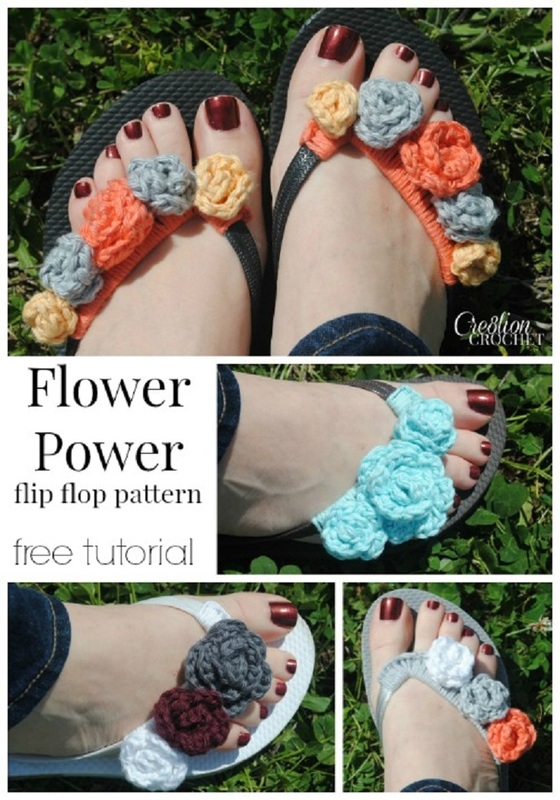 Turn your boring flip flops into a flowery perfection. This free pattern will show you how to add a crocheted base to the straps and then attach adorable flowers. What is great about this particular pattern is that it includes 4 different size of flowers and style ideas so you can use your creativity in your choice of color and size. Fun and pretty. Ring-a-ring o’ roses, a pocket full of posies… We simply love these posy ruffle flip flops! This is such a great pattern that is suitable even for beginners. Make sure you use 100% cotton yarn. The colors and the size of the flowers is all up to you. The pattern is free, all you need is to register if you are not a member already. Look at these double-crochet petaled flowers! They look so pretty. We love how they are finished with a button – it is so simple, cheap yet unique. The pattern is free to download and easy to follow. Parfait Yarn by Premier is the yarn used in this project, using a solid color for the flower and a multi-color for the band. 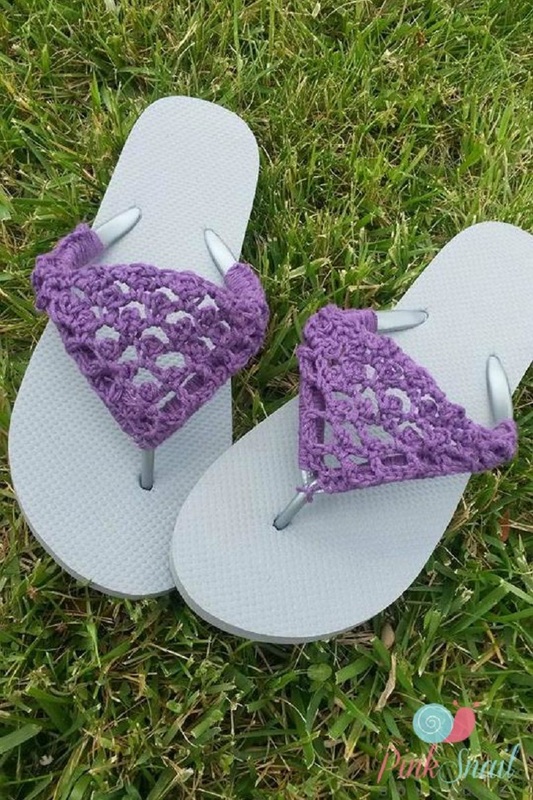 Use light yarn and follow this free pattern to create beautiful crocheted flip flops. They are so light and comfortable that you will truly enjoy wearing them, even you live in a very hot climate. The pattern is free, easy to follow and suitable for beginners. There is even a tutorial in pictures that will show you the process step-by-step. Turn a pair of flippers from plain to pretty with this free pattern. It is a quick and easy project and you will love how your flip flops will turn out. 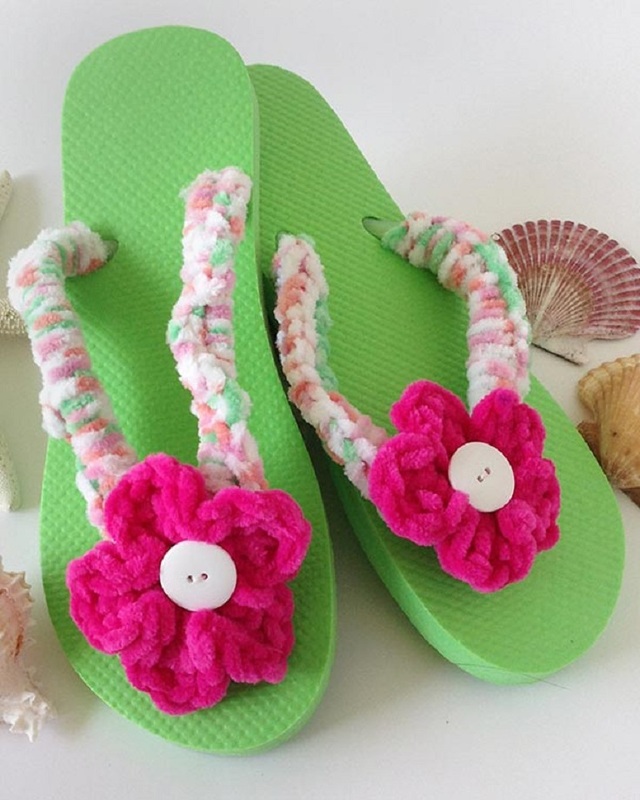 What you need to make these flowery flip flops is a pair of inexpensive flip flops, worsted weight yarn, H hook and tapestry needle. As we already said, barefoot sandals are great to wear in the heat whether you are on the beach or in your backyard. 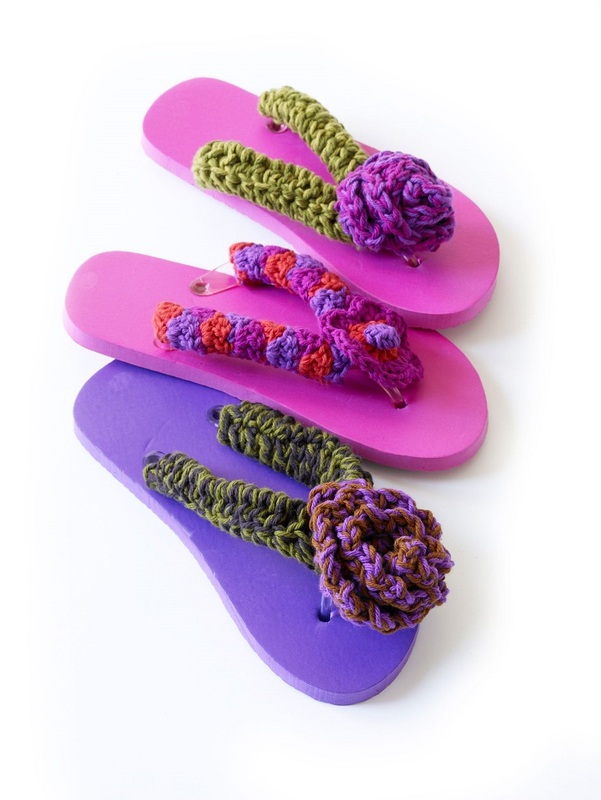 These flower barefoot flip flops are fun, versatile and pretty. You can choose different colors and mix them as you wish. The pattern is easy and free. Mei Mei’s Bamboo Yarn in Hollyhock was used for the sandals on the photo. 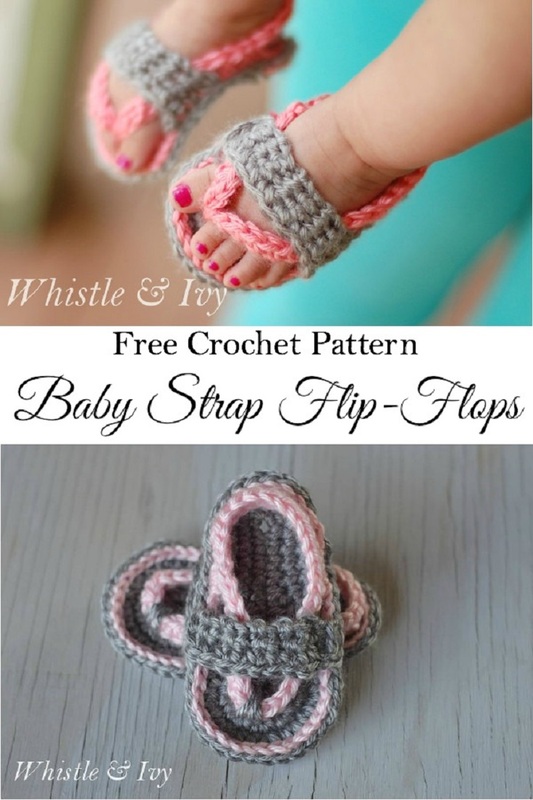 We are continuing this pattern round up with a couple of baby flip-flops. They are so cute and adorable and easy to make. Perfect for those little chubby feet. It is very important to use a high quality soft yarn. The pattern is so versatile – you can mix colors, or dress them up with buttons, beads, or appliques. Beautiful! Baby flip flops are the cutest! This baby shoe pattern will show you how to make this adorable pink sandals that will actually stay on your baby for hours – even on the summer heat. You can choose whatever color you wish. What you’ll need to make them is: Caron Simply Soft (Strawberry and Heather Gray) and a size F Hook Yarn Needle. These butterfly barefoot flip flops make a perfect summer accessory for a little baby girl. They are colorful, comfortable and oh so adorable. To make them as shown on the photo above you will need Lion Brand Bonbon Yarn in orange, pink, and Yellow, size G crochet hook, small button and a tapestry needle. The pattern is actually quite easy to follow once you get into the swing of things. There are step-by-step photos to help you on the way. Have fun!